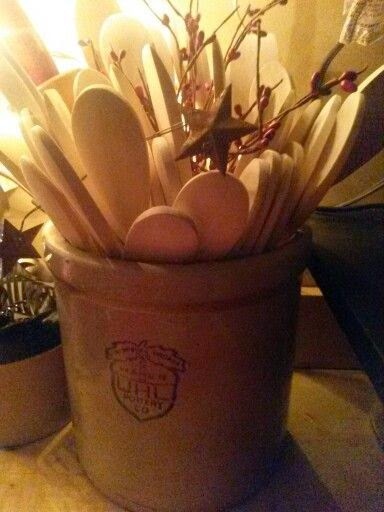 A country must in my prim themed kitchen is old time colored prim wooden spoons. Instead of going out and buying some pre-made, I thought I'd try to make'em. 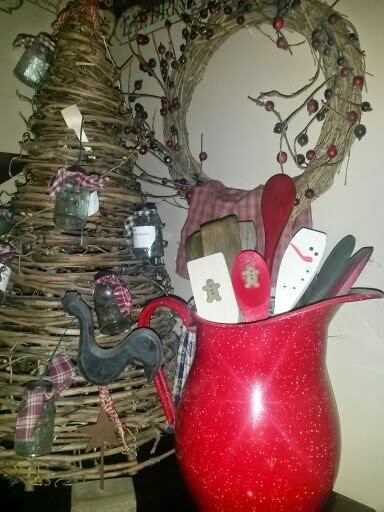 After all I had plenty of plain wooden spoons laying around after making the Snowmen Wooden Spoons. If you notice, I try to stay with old timey colors such as reds, greens, grays and blacks. I just like them better. I wanted to throw in a mustard colored one, but have ran out of that color. This is my favorite crock. And here is where I store my plain spoons. I just love it! First off, I took them outside and lightly spray painted them, both sides, black in the Rustoleum brand. The color was nice and strong, but it took forever doing so by hand. Keep in mind, I bought about 10 packages of these spoons to make, so that I could also sell some in my Peddlers Mall Booth. So I'm sticking with the spray painting! by mixing the preferred color (at this time it was actually another flat black but I had a pic of the burnt umber) I mix them about 50/50 and apply kinda sparse. You don't wanna fully cover up your first coat of spray paint. You want to let it kinda show through. (I wish I'd snapped a pic of another color spoon below other than black to show what I'm talking about, but I'm sure you get the idea.) You just wanna kinda give it a paint on paint look. Not just one solid color. And then I went back and added a piece of jute string to some of the handles. Just to make a lil more country look. $4.95 in my Peddlers Mall Booth. I'm also planning to add these to my Etsy shop soon. They'd be great as a display in an old mason jar in your kitchen. I may be making some Christmas ornaments out of these in an upcoming post. So I better get going and start drilling some hanging holes. Don't forget to check back soon to see them! Here's some mixed in with my Snowman spoons too. So simple, but a lovely finish! Did the spoons come from the craft area of wal-mart or the kitchen area? Thanks Noner! Oh, they came from the kitchen supplies area in a mesh bag. I checked the Dollar Store first, but they were actually higher there.